The Supreme Court failed millions of immigrant families, who waited in vain for news about whether they could begin contributing more fully to their communities. We deserve better. The court can and should correct this grave error by agreeing to rehear the case when it is fully functional. And, the Court has a process to do just that — by granting what is called “rehearing” of the case. Last week, the Court split evenly on whether the executive branch was within its lawful authority in announcing two initiatives — an expansion of Deferred Action for Childhood Arrivals and the creation of Deferred Action for Parents of Americans and Lawful Permanent Residents (DAPA). These initiatives would allow millions of immigrants with long-term ties to the United States to apply for deportation deferral and work authorization. This non-decision leaves in place by default the Fifth Circuit Court of Appeals’ decision to keep these initiatives blocked, leaving immigrants in limbo. Rehearing is appropriate, in fact, necessary, when the Supreme Court is deadlocked to ensure that cases of national significance do not remain unresolved simply because an unexpected vacancy prevents a majority decision. Granting rehearing in Texas is in line with the Court’s prior treatment of rehearing requests and absolutely essential where, as here, the issues are of such profound national significance to both American families and the American legal system. Supreme Court Rule 44 essentially creates a procedure to allow the Court to re-examine its prior decisions. This is extraordinarily uncommon. Indeed, while it is extremely rare for rehearing to be granted when the case was decided by a majority, it is more common for the Court to re-hear cases where a vacancy prevented a majority opinion. And our legal system needs such a rule in cases like United States v. Texas. Most recently this happened when Justice Roberts was appointed Chief Justice in the wake of Chief Justice Rehnquist’s death. Several cases, includingGarcetti v. Ceballos and Kansas v. Marsh were heard before the Court during the time between Rehnquist’s death and the confirmation of Justice Alito. The Justices, excluding Justice Alito, voted to rehear the cases upon the start of Justice Alito’s tenure on the bench. History provides us with additional examples of the utility of this rule. During the Court’s 1954 term after Justice Jackson died suddenly of a heart attack, the Court heard re-argument in three cases after Justice Jackson was replaced by Justice Harlan. The Court need not even wait for a ninth Justice to be confirmed before granting rehearing. When Justice McReynolds retired on January 31, 1941, the Court granted three rehearing petitions even before Justice Byrnes was confirmed to fill the vacancy. Earlier today, the Supreme Court denied rehearing in the Friedrichs v. California Teachers Association. This should not deter the Court from rehearing the Texas case. Friedrichs is an entirely different situation as there was no nationwide injunction and presently there are dozens of cases on the issue working their way through the federal courts, providing ample opportunity for the Supreme Court to reconsider the issue. This is simply not true of Texas, where a nationwide injunction imposed by a single court would be allowed to stand without rehearing. Moreover, Friedrichs involved an explicit request to overturn settled Supreme Court law (the Abood case), which provides adequate guidance to the lower courts considering the issue at hand. 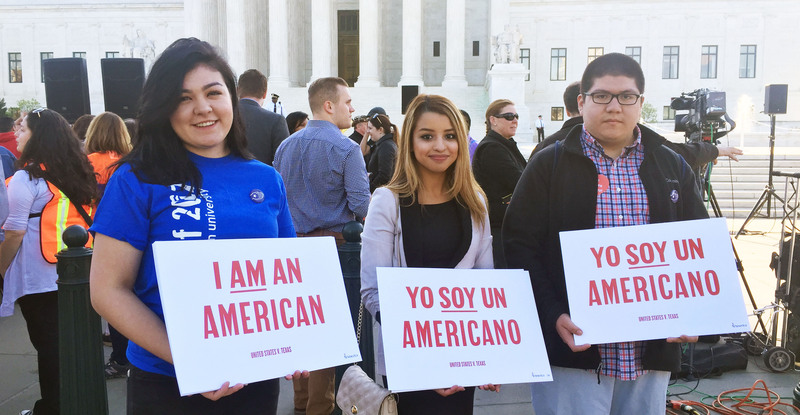 The Supreme Court must rehear the Texas case when nine Justices can decide it — not only for the sake of the families who await the opportunity to apply for DAPA and the DACA expansion, but also for all of our communities who would benefit from such an opening. Indeed, requesting a rehearing would cost the Obama administration little more than its time. And the cost of not doing so is untenable. This entry was posted in Blog on June 28, 2016 by Richard Irwin.